When the first touch-only OS debuts on one of the hottest pieces of hardware this year, you can bet we want a piece of the action. Windows Phone is where Nokia want your attention, but it might turn out that MeeGo is the place you want to be. 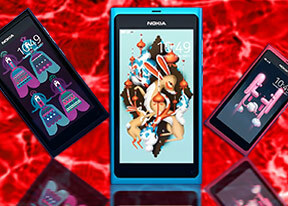 Not shown much love by its own maker, the Nokia N9 is embraced by the consumers. You won’t see Stephen Elop getting all too fired up about MeeGo and spending hours explaining how it’s the best thing since Santa, sauna and the N95. But if you care to look, you'll notice thousands of people hitting our site each day to just check out the Nokia N9. And when a smartphone’s popularity is off the charts without it being all over TV, it must really be something special. The Nokia N9's list of features is worthy of a flagship, but the pinnacle is undoubtedly the MeeGo platform. It’s what makes all the remaining bits work together to create a seamless user experience. The light and agile MeeGo does well without a massively overclocked multiple-core CPU too. We were amazed by the silky smooth handling when we first met the N9 back in June. If you can pull off that kind of performance, it doesn’t really matter what kind of chip is doing the math inside. The question is though how well the Nokia R&D team used the time since our first encounter. For all its potential, the N9 was but an early thing back then. It should by now be ready to deliver the novel and compelling experience we were promised. You can bet we are as eager as you are to find out, so let’s cut the small talk and get to work. Join us after the break, where the hardware checkup begins. any idea about how to activate or install store on nokia N9 as i need whats app on it.